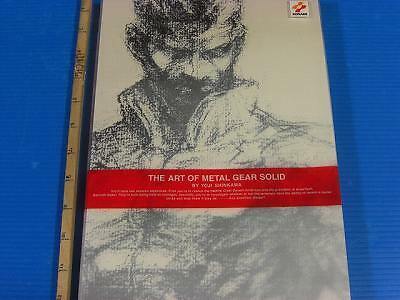 Art Book Collection Thread Show Off & Talk About You're Gaming Artbooks! The book itself is a hefty 180 pages, sadly it is not hardback, but the plastic cover it comes with is pretty strong so it gives it plenty of support. 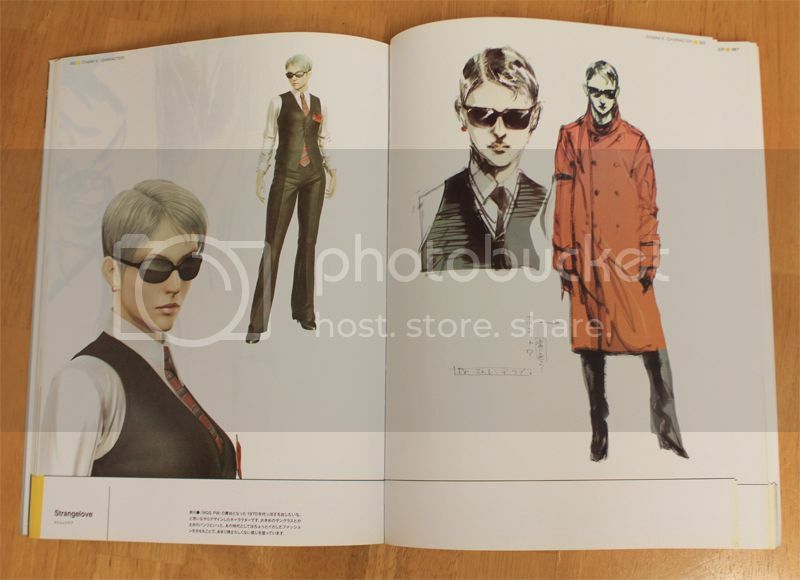 The book is split into two sections Promotional art which was used for poster and some images directly for certain gaming magazines - This I found fascinating as I thought it would just be the magazine companies sourcing the images they could find, not having the images made for them. 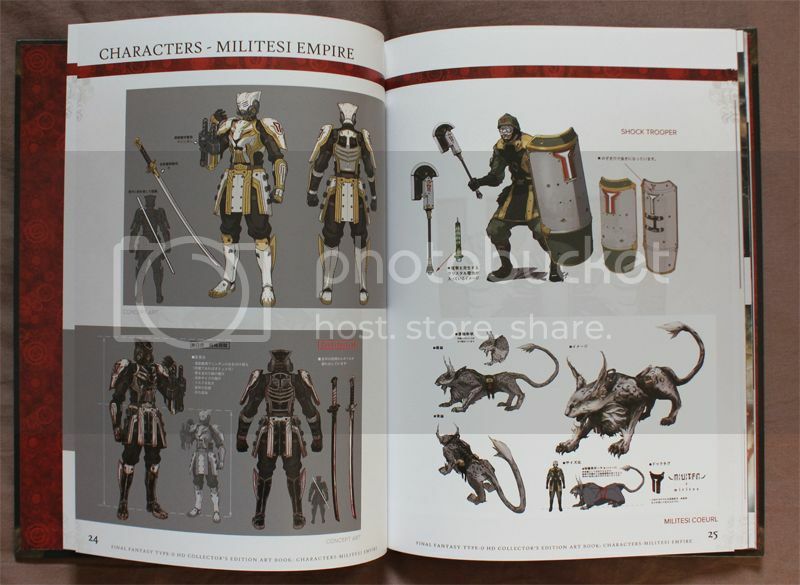 It also has many detailed concept art of the characters. 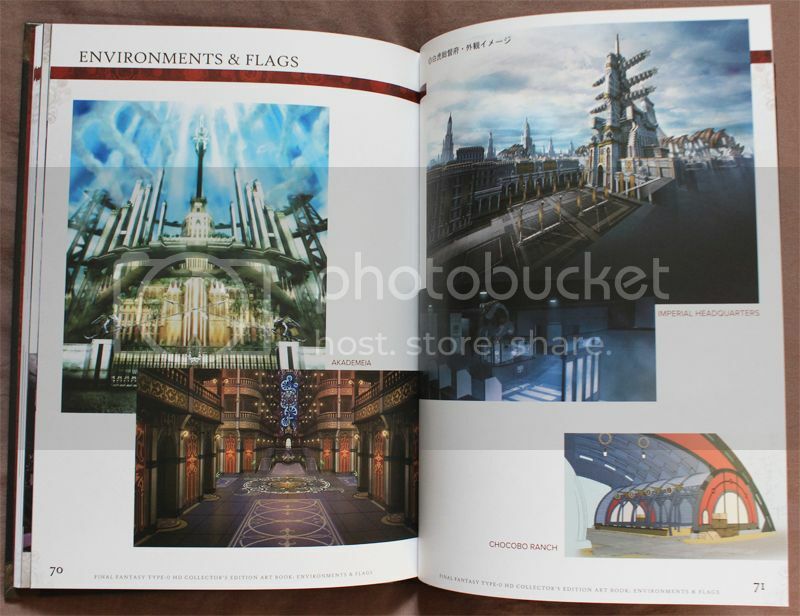 The second half of the book is the concept art, so the nitty-gritty design elements of the game, the imagery looks superb presented with such a fine print from the book. It also points out little details you may never had known, one that caught my eye was some sketches of Grey Fox's mask opening up, with images displaying multiple stages of the motion. 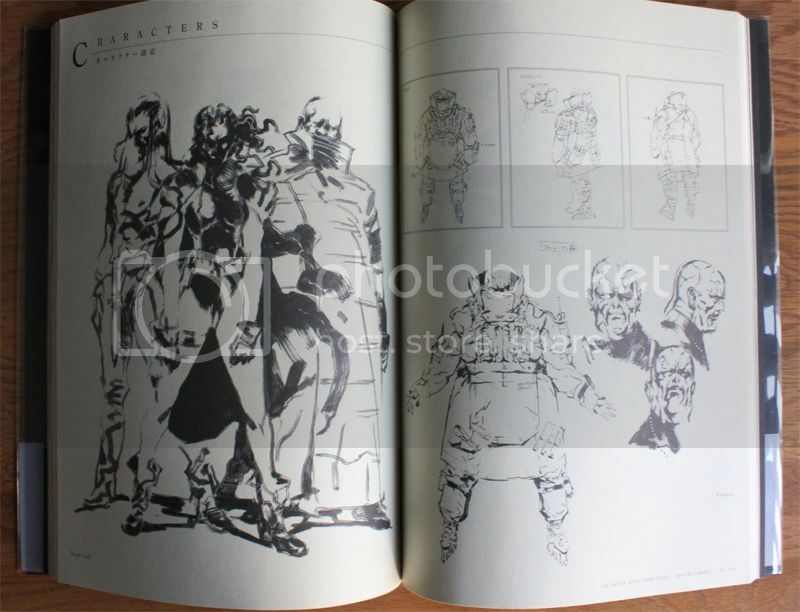 It also contains the early designs of Metal Gear and the characters, even what Sniper Wolf looked like as a man, or Vulcan Raven with hair. It really displays the thought process and progression of the designs so well. 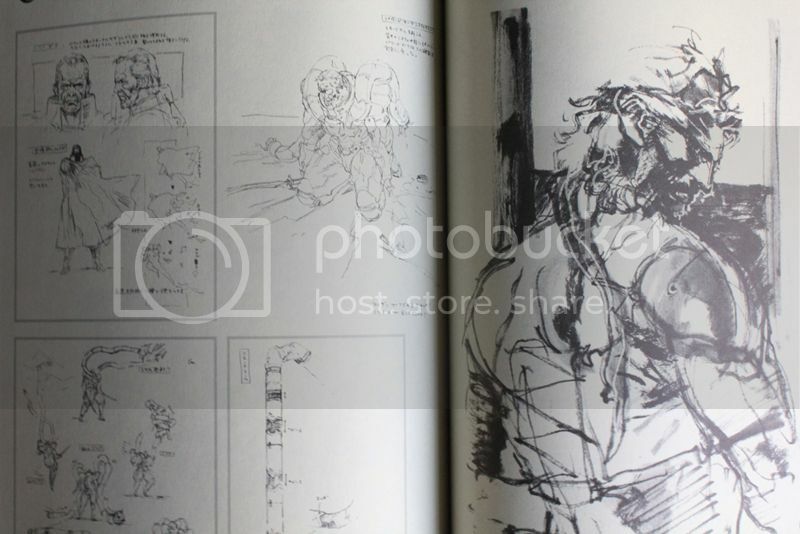 To top it all of the book ends with an interview in English too with Yoshitaka Amano, who I regard so highly for working on the concept art for Final Fantasy (Had I not picked this book, it would have been 'The Art of Final Fantasy IX' which I also adore.) Which was brilliant to hear two people at the top of their profession talk about their experience and conflicts. I just find this image so striking, The heat from the bottom of the page that streaks up the design of the characters is just very stylish. I also admit I am very fond of these 3 characters so to see them together in this one piece is a treat, I also like the composition as it demonstrates the level of detail Shinkawa puts into a character close up, medium and in the distance, each one with a different style but blends together so well. I managed to snag the book for £25, considering it goes for £80 - £100 I am very pleased to say the least. But it is not just that it is a rarity, the book utterly delivers in content design wise and from my impression delivers a perfect display of what is required from a concept artist in a project. 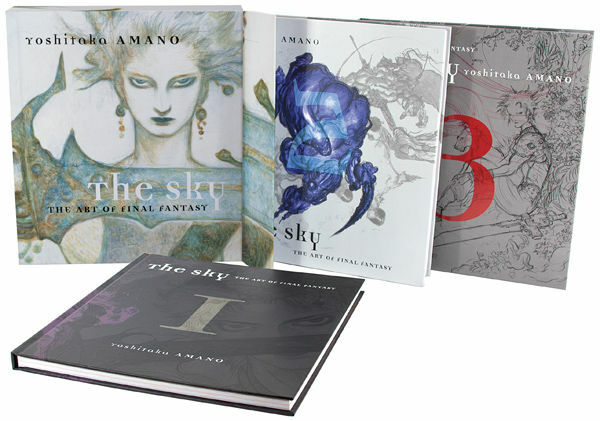 Amano's ethereal illustrations for the first ten Final Fantasy games. 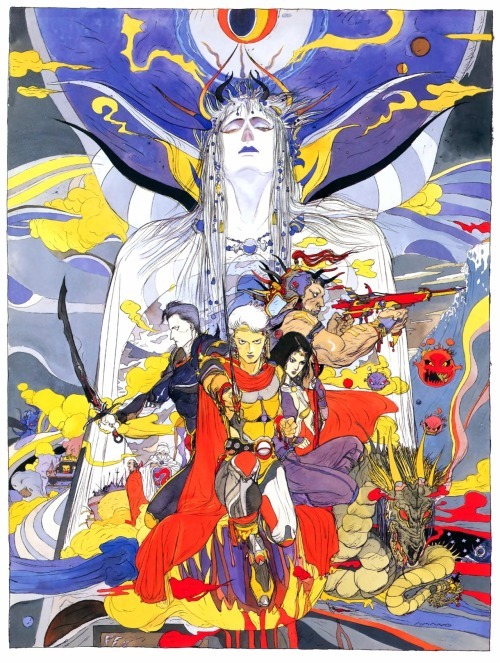 Funnily enough I haven't even played Final Fantasy II yet (Along with III & V from the main numeral series) but I just love how bold and vibrant it is. I also love all the details like the Bombs, the sea and mountain terrain which you don't initially see. I wonder if they will ever be able to make a Final Fantasy that replicates Amano's wild designs. Not truly a guide book, but I love the Ni No Kuni CE guide with art in the back. Though if I can count another book, the Wizards companion is truly a sight to behold in terms of artwork. Bringing this back thread back! 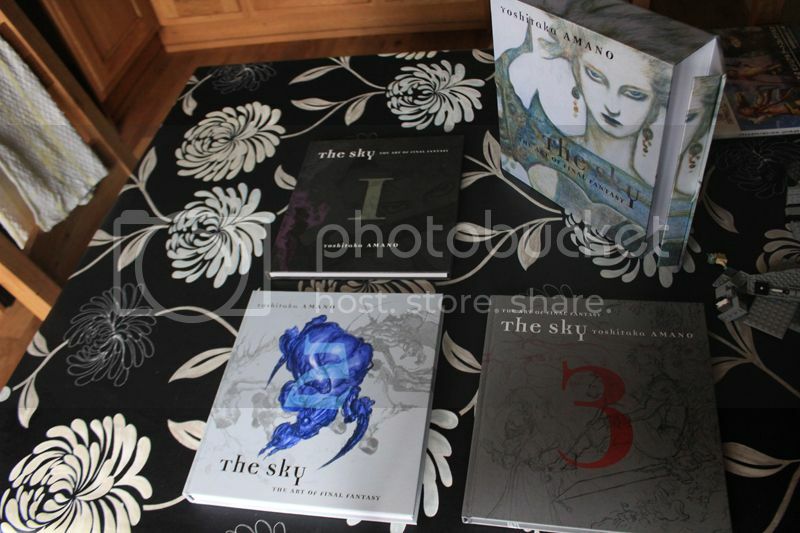 I talked previously about how I wanted the Final Fantasy: The Sky art book well, it turned out my local GAME had one even before Amazon stocked them, needless to say I jumped in line and launched for it. It's just such a lovely boxsets words just cannot describe the value you got for this collection. I don't care if it is not an original edition, the quality of this release is second to none. Here is a photo next to a PS2 game just so you can get an idea of the scale of these books. There are 3 books overall in this set, Book 1 - Final Fantasy I,II & III. Book 2, which covers Final Fantasy IV, V & VI. Then Book 3 which covers VII, VIII, IX & X. Book 2 is the biggest book by far, I was a little disheartened to see that book 3 was the smallest, but when you consider how Amano wasn't as involved in them games as heavily as the earlier titles it backs sense. 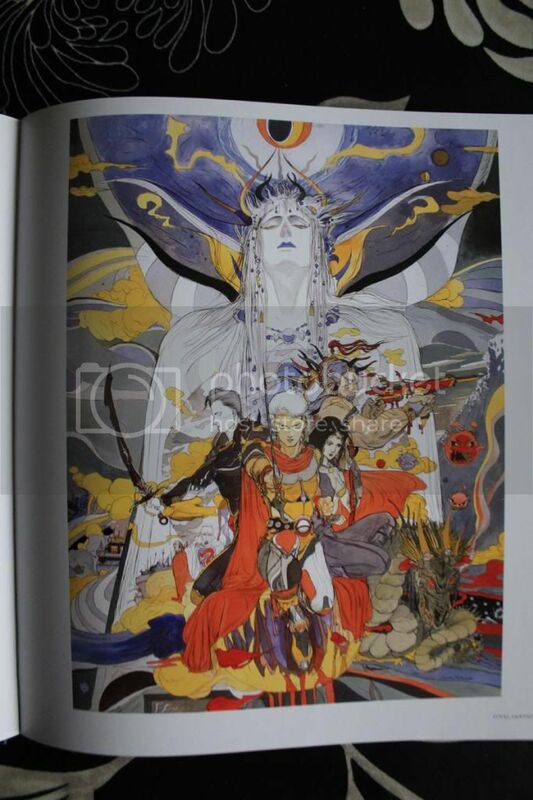 This is piece for Final Fantasy II, it reminds me of them Star Wars posters which have a collage arrangement. The characters aren't all in proportion but it uses the size to dramatic effect - The Villain being large and hovering over the characters for example. I like the purple colour scheme but what really interests me is the detail, there are just so many things going on from bombs, to stars and boats on the sea. I just find it interesting to look around. I have yet to even play Final Fantasy II yet, I have a PSP version and should really work on that. I really wanted to choose something from VI as it is my favourite game of the 3 by far, but I just love the design of this airship! It's just so colourful and wild. I like how it looks like a surreal zeppelin, with so many compartments that look like they could be airships on their own. Also, not how even though this image is spread over two pages and none of the detail is lost in-between - This is a sign of a well designed book! While this might not be my favourite illustration in the book, it really took me by surprise, by now I had seen most of the art work for these games by years of research but I have never seen this piece before looking in The Sky. What I love about it is how the setting the cast around a camp fire in the woods. It shows my favourite aspect of JRPG's that sense of being part of a team on an adventure. 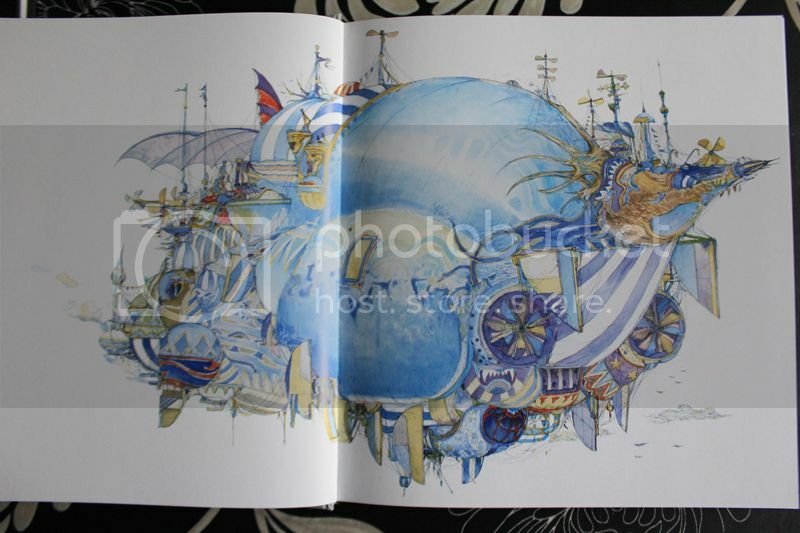 I love this book to bits, I have wanted a Final Fantasy Art Book for years and while I was content with the Final Fantasy IX one I got last year this is just beyond what I could ever hope for. 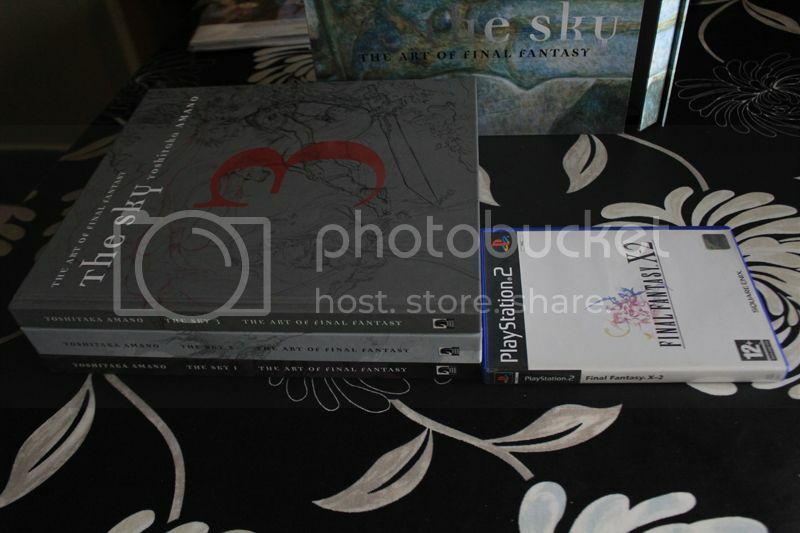 If you are a Final Fantasy fan you must have this or even if you appreciate video game art you'll be challenged to find better value for money than this boxset. Is there any descriptions in there? Or is it purely art? It's purely art, sometimes little descriptions can be nice But these books are about seeing the art. There are 576 pages overall and the quality of the paper and print is just so superb. Sorry about shoddy camera work. 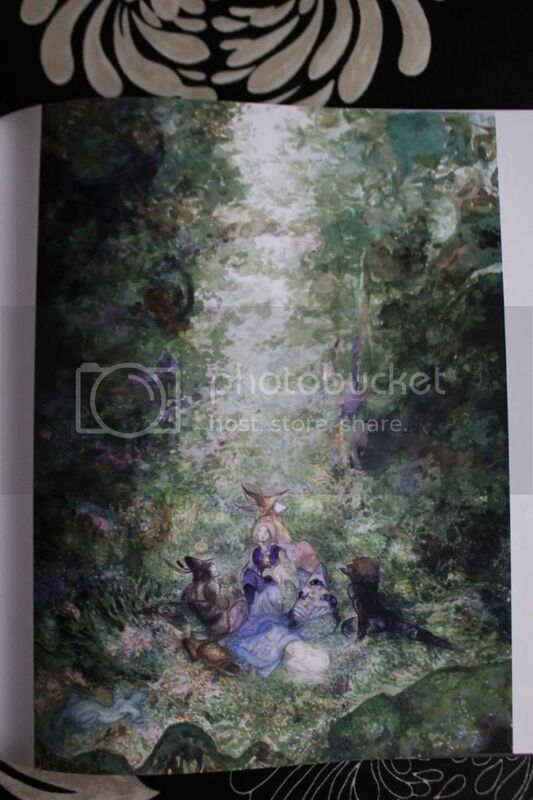 This is actually a lot more difficult to get hold of, I have never seen it go under £90 myself until recently this seller on eBay sold it for £45. 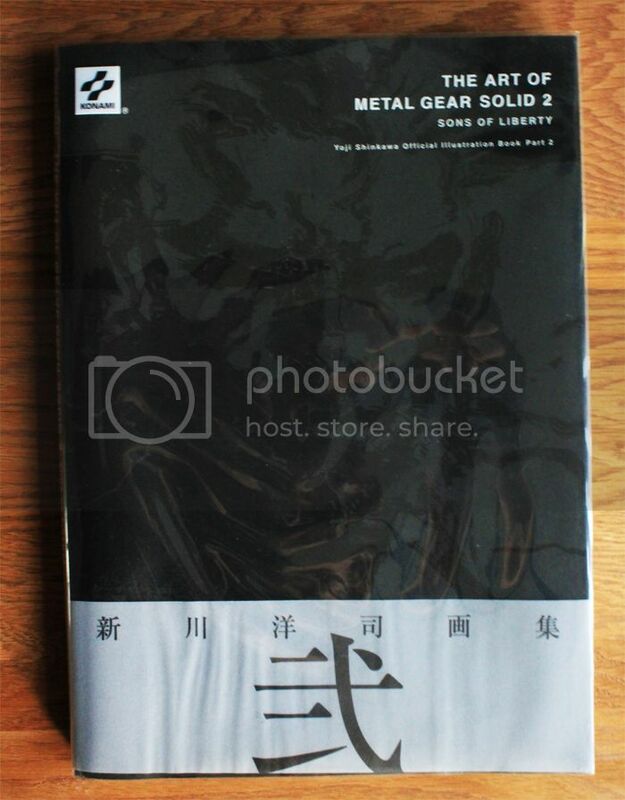 Metal Gear Solid 2 is one of my favourite games of all time, so this was just an necessity for me. 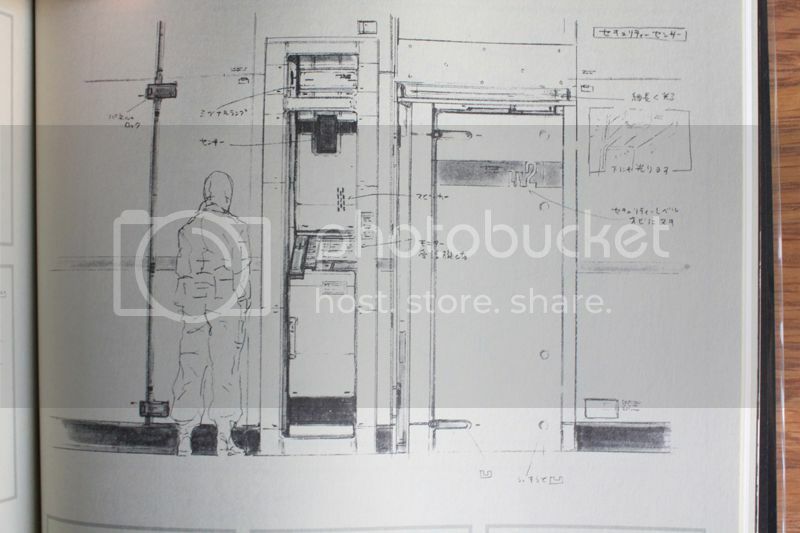 The book itself is just as comprehensive as the first, with such a huge variety of artwork from promo art, concept art and even rough sketches. I'd say the only major difference this time is we don't get brief paragraphs from Shinkawa himself on the work unlike the previous book. Once again if you have any books you enjoy please feel free to share them, it is an important part of game creation and I love to hear about what others enjoy, so feel free if you have any content you want to share. This book has been published by Dark Horse, who also made the wonderful 'The Art Of Final Fantasy: The Sky' Artbook shown previously. The book itself is slightly larger than A4, Hardback and has a good 175 pages - The pages are thick and of great quality too. 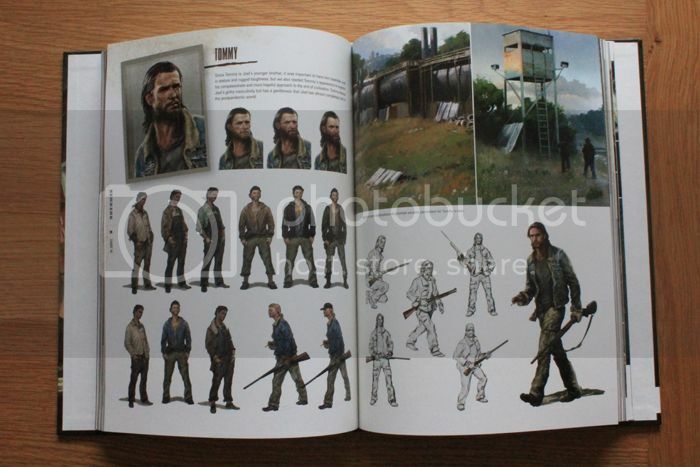 The book covers a broad range of the development from early concept drawings of the main characters to an in-depth analysis into the creation of the infected. 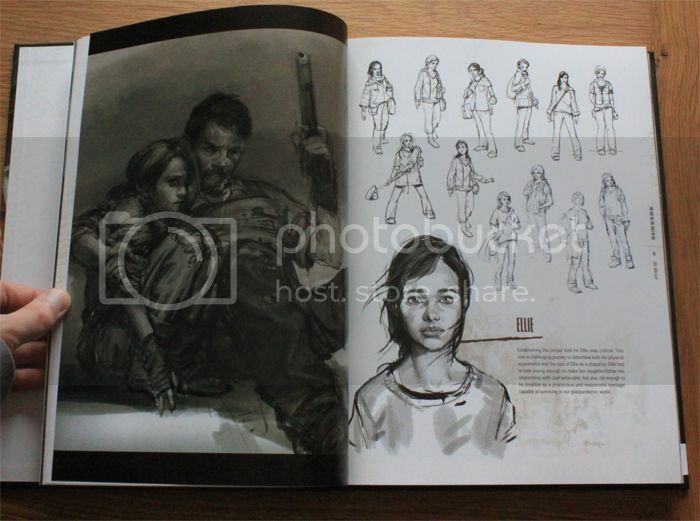 I really approve of the structure of this book as it first details Joel & Ellie then it goes through the art covering each area in chronological order, so it would be a great companion piece while playing the game. The artwork is detailed and has a wide variety of character art, environments and infected and it is great to see how they went from earlier designs into finished concepts. One thing, which is a personal negative point is that the art design is mostly digital art, so it has that wishy-washy effect seen in a lot of concept art these days. I've just never been fond of it myself. So that's about it, overall very pleased with the artbook and enjoyed looking through it and reminiscing my experience with the game, one which is undeniably one of the standouts of this generation. 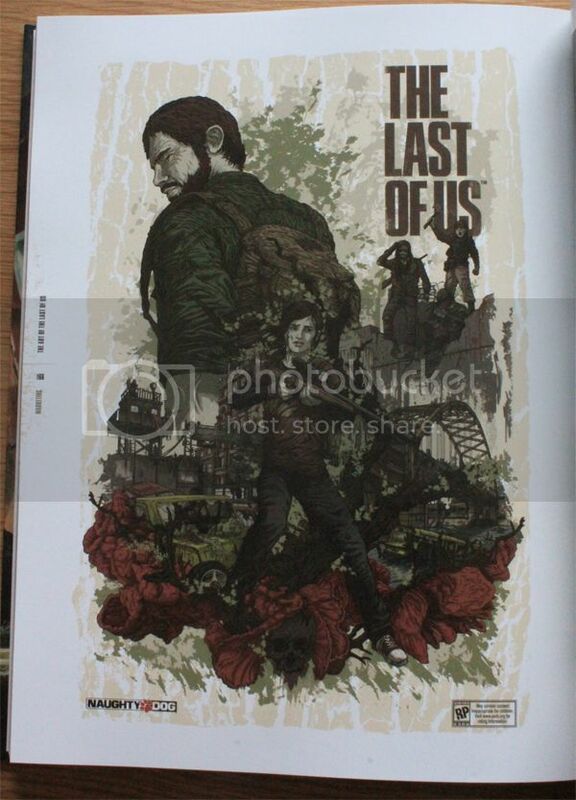 I absolutely love TLoU and bought that art book right away. I think I simply forgot that I bought it simply because I was so blown away by the game. Overall I don't think I go out and purchase art books in general. I rather wait for them to be released in a CE or wait for them as gifts. Yeah, you can do that in the US, the European special edition artbooks are never as good, they're usually A5 tiny little books which are pathetic or we get the art at the back of a guide... 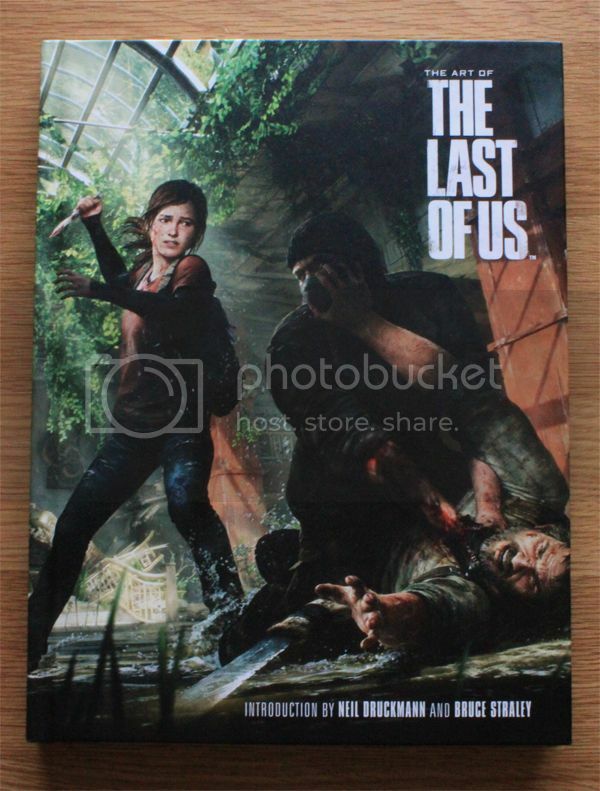 However, companies have been releasing more and more artbooks in recent years, even in the UK I can buy ones like the Last of Us, Remember Me, Bioshock: Infinite, Assassins Creed, so they;re becoming more available. But I love looking through them, they give you a great insight into the design choices made while the game is in development. I also find them really exciting to look at and appreciate the talent of the artists involved. I got something wonderful today! Nier has always been one of the more striking game this generation for me, it is the perfect blend of action/JRPG for me. The story is really unique and demands multiple playthroughs which really enhance the experience. The art design for the game is really unique too and I have always wanted a book that focuses on this. The book itself is sort of an all round book, which covers the story with interviews (Sadly which I cannot read), a walkthrough and artwork. Despite the text being in Japanese the content of this book is still very satisfying. The book is smaller than A4 but still a good size. 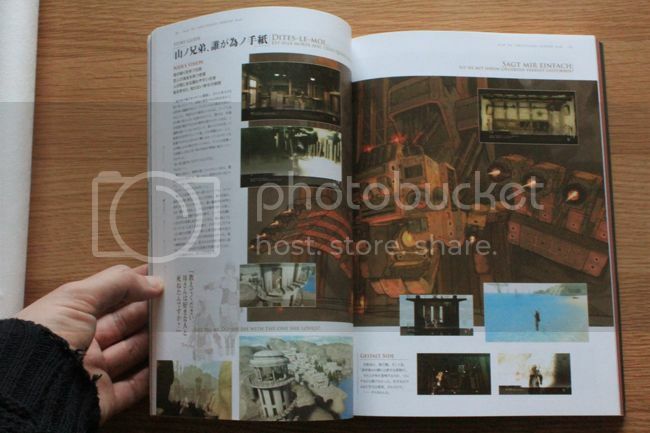 I haven't seen much of the Art of Nier, so the book is a real treat, it features character concept stages, environments and weapons. I haven't had too much time to look over it but I am very content with the purchase - It even arrived only 3 or so days from Japan to England. So overall very happy, I never thought I'd get this book at a decent price, I bought it off Amazon for New at £20. Man, I loved what I played of Nier. I wish I could understand Japanese because this book would be a purchase right away. Bringing this thread back, artbooks are awesome! I love this! It was part of the Collectors Edition set which I know Kennyrh has already showed off. 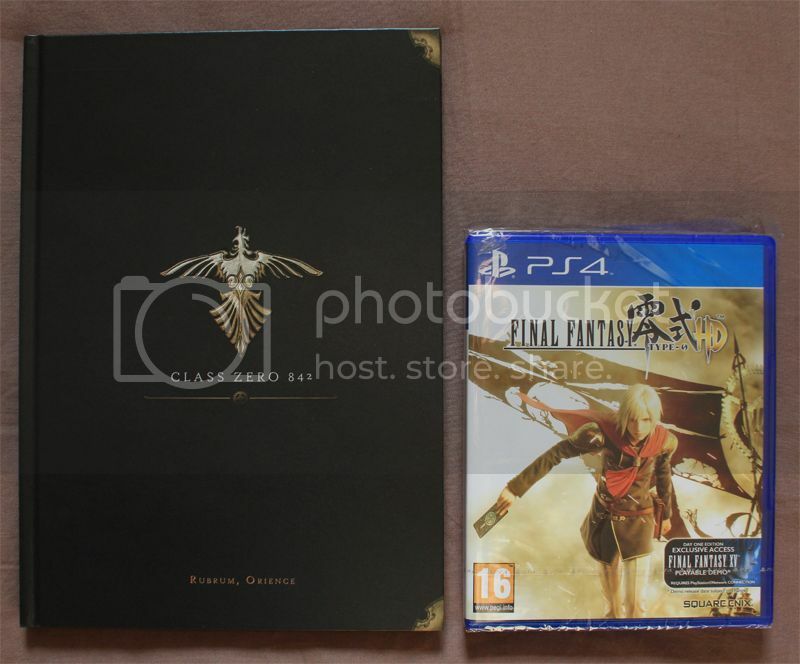 What I love about the artbook is its not one of them crap little ones the size of a game case, it's near A4 and hardback! brilliant. The artwork shown is superb and well organised. I managed to haggle it down to £13 and for that price I am very content. It has 80 pages, so a little thin but it is bursting with content and just a very pleasant book Happy indeed. Glad you found one, Vivi. 13 quid seems like a fair price. 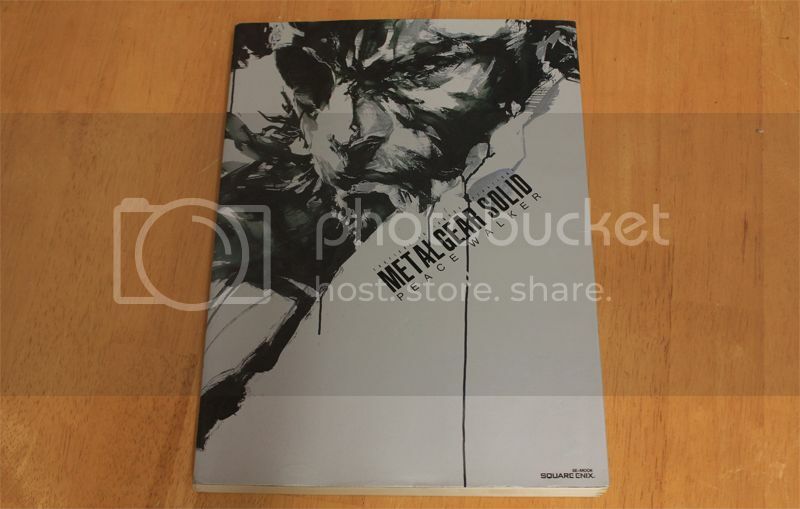 That might seem steep but, in my experience, most UK artbooks are 30 quid sealed. If you want it that badly I'd say go for it - assumung you've got any dosh left after all this Type O expense. Personally, i want the other Typse 0 steelbook that GAME are doing, now that I've seen it in the flesh so to speak. with the MGS book i take it that the comments arnt in English ? 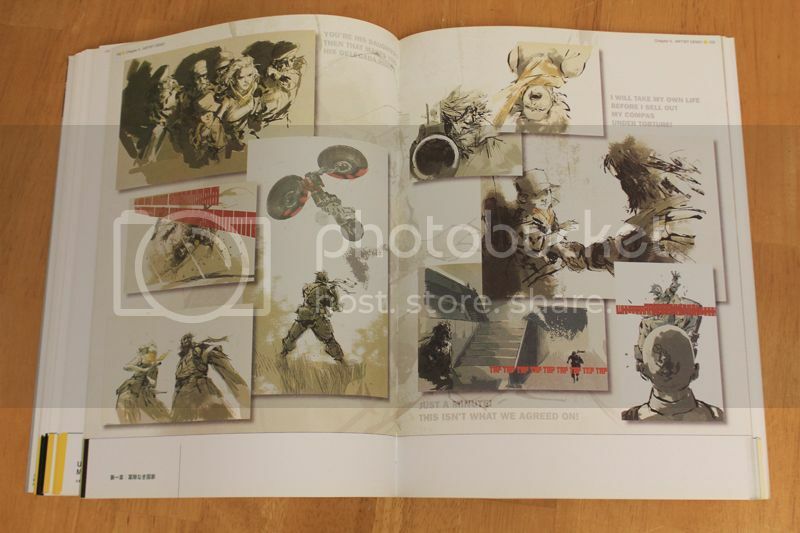 It's a bulky book with 200+ pages of art, like previous metal gear books it features great concept art showing off the desgin choices the studio went through. Plenty of drawn art of characters, mech and environments and gives off a real presence of the game. It's not hardback but it delviers in such a wide range of imagery, ever so pleased with it. 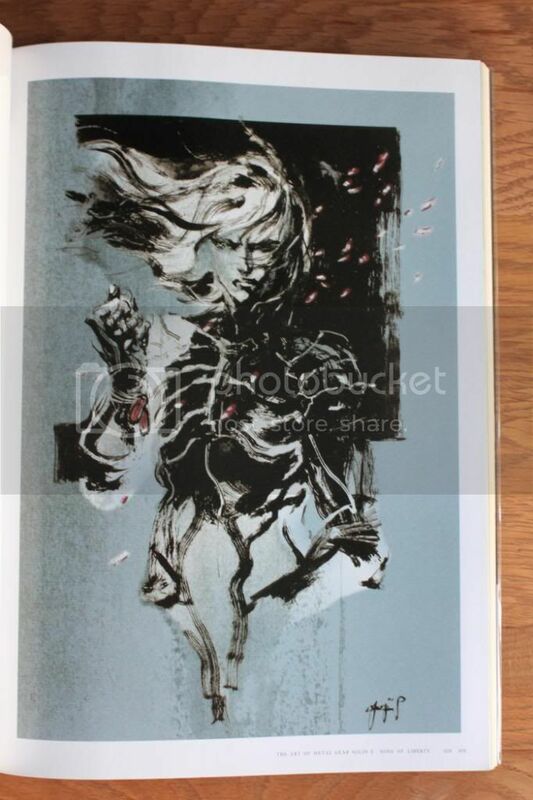 Ever so grateful, as this wa an Artbook I always wanted to get myself It was released around the time of Mass Effect 3 and includes art from the 3rd game - even content regared as spoilers, so it doesn't compromise on quality. 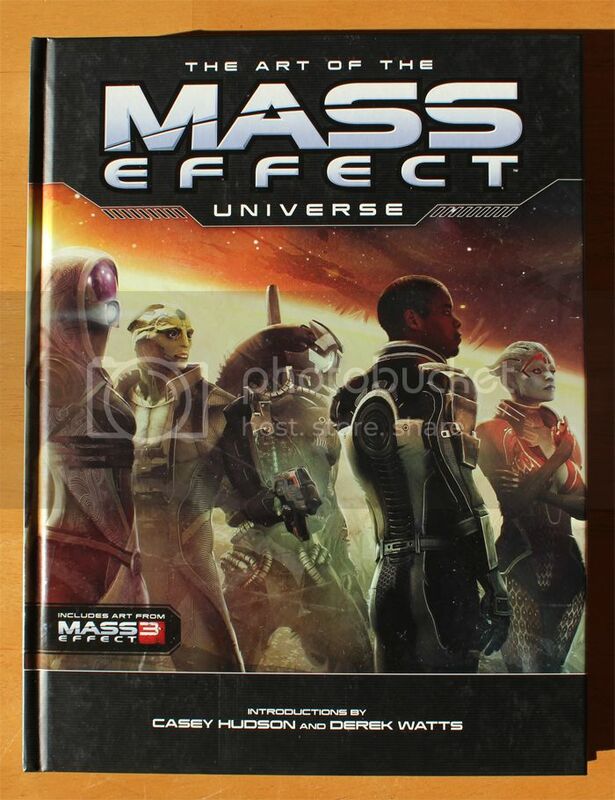 Really worth getting for all Mass Effect fans.